Do I need to wait until all the baby teeth are lost before starting Orthodontic treatment? 1. Some of the permanent teeth are larger than the primary teeth they replace. Using braces to open space for the permanent teeth help them erupt in a better position. An example is the maxillary cuspids. If there is not enough room for the upper cuspids to erupt, they will assume the path of least resistance and erupt in an ectopic or incorrect way. In the case of a crowded cuspid, the cuspid will usually try to erupt into the palate. Since palatal gum tissue is very thick, it makes it difficult for the cuspids to erupt and they may become impacted. 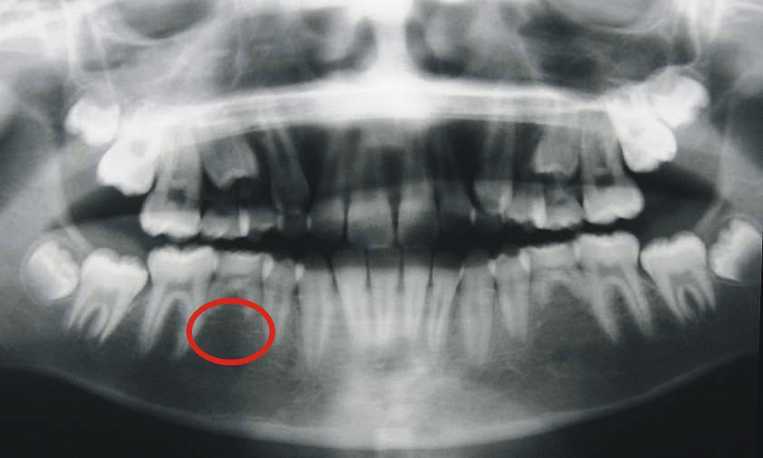 If braces are placed before the cupid erupts too far, space can be created around the primary (baby tooth) cuspid, so that the permanent cuspid will erupt better. 2. Some patient’s permanent teeth never form (hypodontia, oligodontia, partial anodontia). Look at the radiograph (x-ray) above. Both the left and right lower 2nd premolars are congenitally missing. Only one side is circled. About 10% of the population will have congenitally missing teeth. The teeth that are commonly missing are, the maxillary (upper) lateral incisors, the mandibular (lower) 2nd premolars and 3rd molars (wisdom teeth). In cases where the patient is congenitally missing a permanent tooth, the baby tooth will not exfoliate because there is not a permanent tooth resorbing the roots away of the primary tooth. So, we don’t need to wait on the primary tooth to be lost because it never will. 3. Some patients receive their primary teeth later than the average. Most patients begin orthodontic treatment when they are 10 to 12 years old. This is an ideal time. The reason it is an ideal time is that the growth the patient will go through allows an orthodontist to create space and modify the growth of the upper and lower jaw. If a patient receives their permanent teeth late, they will start treatment at ages 13 or older. We will loose valuable growth of the child that we could take advantage. Orthodontic treatment is best performed while the patient is going through rapid growth. If you wait on the primary teeth to be completely lost in a patient who is loosing them late, you will miss this growth advantage. These are some of the reasons your orthodontist may want to start treatment while some primary (baby) teeth are still present. Please consult your health professonal for a complete examination and consultation. ← Previous Previous post: What is a Crossbite?